PortAventura is hands-down one of Europe’s most iconic theme parks. Visiting the park, drenched in sunshine and exploring the six zones is awesome. Pushing the limits on your hen do in Barcelona is what makes this place so special! Flying, falling, spinning will energise you and the girls. This makes it a perfect activity to get pumped up for a big night out in Barcelona. There’s nothing like it! There are over 40 rides for you and the girls to discover, and you can enjoy cool food and drinks throughout the day. 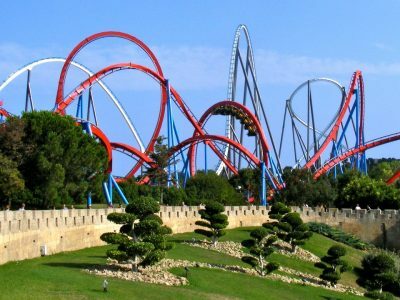 The park is located about one hour from Barcelona, but don’t worry – we can organise return transfers to the park for you. Just let your party planner know and we can send across the details!